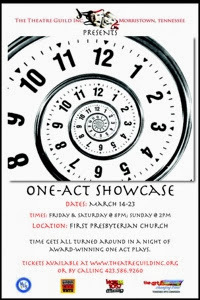 Once again I've been working with the Morristown Theatre Guild, directing this One-Act Showcase which opens next Friday. The Guild is celebrating their 80th year with the start of this season - that makes them one of oldest businesses in East Tennessee plus the oldest community theatre in the state too. The award winning shows in the Showcase include 3 one-acts from the collection "All In The Timing" by David Ives and a fourth one act, "Black Comedy" by Peter Shaffer. Ives' plays include "Sure Thing", offering a young couple trying to make sure their first meeting gets off to a great start - no matter how many times they have to repeat and repeat what they say to each other; "Words, Words, Words" enacts the old saying that monkeys trapped in a room with typewriters will write a Shakespeare play - or can they? ; and "Universal Language" takes audiences on a roller coaster ride when a woman tries to learn a new language that sounds like pure nonsense. A final one act for the night is the award-winning comedy "Black Comedy" by Peter Shaffer (Amadeus, Sleuth). It's the story of what happens at a dinner party held during a power outage - the audience can clearly see the chaos, confused identities, and constant calamities taking place as the characters behave like they are in a darkened apartment in this wild physical comedy show. The story is set in NYC in 1965. The four one-acts also focus on the very language of theatre itself and how time and place shape a story. An ensemble cast from age 17 to 60 tackle multiple roles and have made a very funny show. Performances are March 14 -23 at First Presbyterian Church in Morristown and you can order tickets at 423-586-9260 and tickets will also be available at the door - show times are 8 pm on Friday and Saturdays, 2 pm on Sundays.